Remote file inclusion (RFI) is an attack targeting vulnerabilities in web applications that dynamically reference external scripts. The perpetrator’s goal is to exploit the referencing function in an application to upload malware (e.g., backdoor shells) from a remote URL located within a different domain. The consequences of a successful RFI attack include information theft, compromised servers and a site takeover that allows for content modification. The graph below illustrates the typical flow of a RFI attack. Similar to RFI, local file inclusion (LFI) is a vector that involves uploading malicious files to servers via web browsers. The two vectors are often referenced together in the context of file inclusion attacks. In both cases, a successful attack results in malware being uploaded to the targeted server. However, unlike RFI, LFI assaults aim to exploit insecure local file upload functions that fail to validate user-supplied/controlled input. As a result, malicious character uploads and directory/path traversal attacks are allowed for. Perpetrators can then directly upload malware to a compromised system, as opposed to retrieving it using a tempered external referencing function from a remote location. 1. A JSP page contains this line of code: <jsp:include page=”<%=(String)request.getParmeter(“ParamName”)%>”> can be manipulated with the following request: Page1.jsp?ParamName=/WEB-INF/DB/password. Processing the request reveals the content of the password file to the perpetrator. 2. A web application has an import statement that requests content from a URL address, as shown here: <c:import url=”<=request.getParameter(“conf”)%>”>. If unsanitized, the same statment can be used for malware injection. 3. RFI attacks are often launched by manipulating the request parameters to refer to a remote malicious file. Here, the first line extracts the file parameter value from the HTTP request, while the second line uses that value to dynamically set the file name. In the absence of appropriate sanitization of the file parameter value, this code can be exploited for unauthorized file uploads. 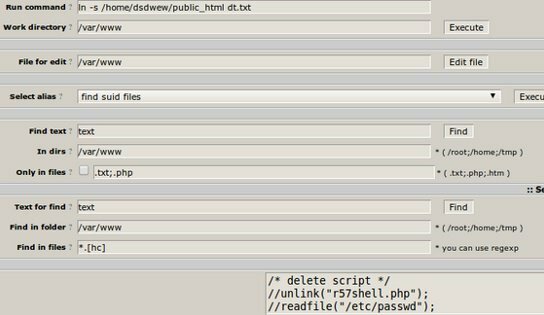 Having been uploaded to the application, this backdoor can later be used to hijack the underlying server or gain access to the application database. The R57 backdoor shell is a popular choice for RFI attacks. To an extent, you can minimize the risk of RFI attacks through proper input validation and sanitization. However, when you do, it is important to avoid the misconception that all user inputs can be completely sanitized. As a result, sanitization should only be considered a supplement to a dedicated security solution. In the process of sanitization, input fields should be checked against a whitelist (allowed character set) instead of a blacklist (disallowed malicious characters). Generally speaking, blacklist validation is considered a weak solution, as attackers can choose to supply input in a different format, such as encoded or hexadecimal formats. It’s also best practice for output validation mechanisms to be applied on the server end. Client-side validation functions, having the benefit of reducing processing overhead, are also vulnerable to attacks by proxy tools. Finally, you should consider restricting execution permission for the upload directories and maintain a whitelist of allowable file types (for example PDF, DOC, JPG, etc. ), while also restricting uploaded file sizes. As mentioned, input sanitization and proper file management practices are almost never sufficient on their own, even if they effectively minimize the risk of RFI. This is important, as many attacks succeed as a result of a false sense of security, which is encouraged by DIY practices. Imperva offers a number of solutions to combat RFI attacks. First among them is our Web Application Firewall (WAF), which monitors user inputs and filters out malicious requests using a combination of signature, behavioral and reputation-based security heuristics. The WAF is deployed as a secure proxy and, as such, blocks all RFI attempts at the edge of the server—before they can interact with your web application. Additionally, in the event that your application is compromised prior to activating our services, Imperva offers backdoor protection—a reactive measure that detects and quarantines backdoors already installed on your server. Finally, our crowdsourcing technology allows us to maintain a continually-updated database of compromised domains that serve as centralized distribution points for malware injected during RFI attacks. Monitoring these domains provides additional accuracy to our filtering process, while also enabling rapid response against emerging RFI attack vectors, including zero-day RFI assaults.